We begin with a scenario: renewable energy technologies, in particular solar technologies, are sparking the emergence of a new peer-to-peer energy market. Centralized energy grids controlled by utility companies will be replaced by decentralized energy markets where producers sell directly to consumers, who can choose what type of energy they want to buy, and from which producer. The energy field is ripe for massive transformation. The exponential growth of solar technologies, much like Moore’s Law for computational power, is opening up massive areas of innovation and disruption. 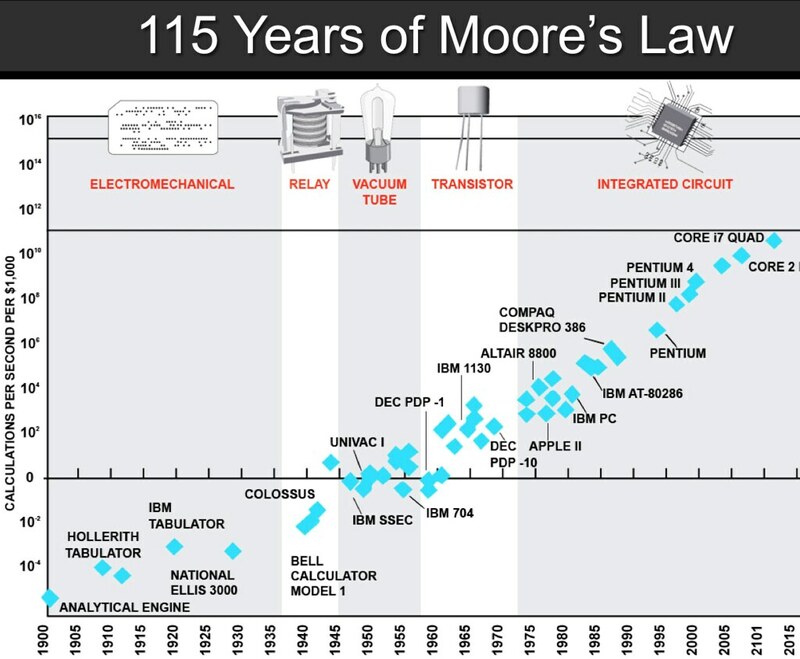 Let’s take a quick look at Moore’s Law to understand the scale of change we may be facing. Named after Gordon E. Moore, cofounder of Intel, Moore’s Law is an observation that the amount of transistors in an integrated circuit will double every two years, or that computing power will double at an exponential rate. This exponential growth has made interesting things happen. Smart phones happen. Facebook and Twitter happen. mPesa happens. The realities of the information age, network age, and big data happen! Exponential growth is a really big deal. Let’s pretend for a second that a large industrial farm is seeking help for an upcoming harvest. The owner of the farm offers to pay a laborer US$2,000 for the season. This seems like a pretty good deal, but the laborer thinks for a bit and says, “I’ll take the job, but I want you to pay me one cent (1/100th of dollar) on the first day, and then double that payment every day.” The landowner agrees, thinking the laborer must be foolish to offer to work for less than the original offer. So the laborer goes to work and gets paid one cent on day one, two cents on day two, and four cents on day three. On day seven she gets 64 cents, still not even one dollar. On day 31, however, she gets US$10,737,481.24! Exponential growth of computing power made way for the information age in a relatively short number of years. This is not a trivial development. We often talk about the information age at the scale of impact as the shift from farming to industrial production. "Today, solar technology appears to be the only technology experiencing a similar exponential growth pattern as computing power"
The cost per kilowatt of solar has dropped from US$20 in 1980 to US$1 in 2012, and the US Department of Energy has projected that the cost of solar energy will be cheaper than traditional energy in the next decade. While it’s impossible to predict exactly how solar energy will transform our lives, given the exponential growth rate we can assume the transformation will be impactful and unexpected. We can begin to explore the landscape of experimentation and emerging technologies as the future takes shape, anticipating possible directions of change. Regions currently struggling with inadequate access to energy, so called “energy poor areas,” will likely experience the most fundamental changes as exponential growth in solar technologies sparks a sea of change. Renewable energies, in particular solar energy, may usher in a new era of “energy wealth” supported by a peer-to-peer marketplace. Renewable energy even offers a way to leapfrog over the carbon intensive development pathways historically taken by industrialized countries. These opportunities could not be coming at a better time. According to The <a href"http://www.economist.com/news/special-report/21639018-solar-giving-hundreds-millions-africans-access-electricity-first" target="_blank">Economist, sub-Saharan Africa, with 1 billion people, consumes less energy than the 4.8 million people in the US state of Alabama. Sub-Saharan Africans on average consume one incandescent light bulb per person for three hours a day. And as with most things for poor people, energy is exceptionally expensive. Poor households purchase energy at the equivalent of $100 per kilowatt-hour, more than 100 times the amount people in rich countries pay. With such low energy use throughout sub-Saharan Africa and 6 of the 10 fastest growing global economies residing in Africa, we can anticipate a massive growth in energy demand in the coming decade. The United Nations has also named 2015 the International Year of Light and Light-Based Technologies and 2014 – 2024 as the United Nations Decade of Sustainable Energy for All. The pressure to produce and distribute energy at global levels we have never before experienced means that old systems will likely become stressed and collapse, opening up an urgent need to find new, more efficient and reliable methods for energy creation and distribution. Back in 2012 it was clear that solar energy had potential to make a large impact on both financial and energy poverty. After analyzing more than 18,000 game inputs for the Catalysts for Change game, we titled the seventh Zone of Future Innovation, Peer-to-Peer Energy Sales. At the time, in 2012, players primarily suggested ways to harness renewable energy locally to provide much needed energy sources to communities cut off from government established utilities. Companies including Selco Solar in India and Solar Sisters primarily in Uganda and Nigeria exemplified the future of locally generated solar energy. Selco Solar is a social enterprise that offers a wide variety of solar energy solutions from households to businesses. Its primary focus, since being founded in 1995, has been to prove that sustainable energy is affordable to impoverished households. To date they have installed over 2 million solar power units throughout India. Solar Sisters is a social enterprise that focuses on turning women into energy entrepreneurs. Based on a direct sales model, women sell solar technologies—from lamps to clean energy stoves—to women in their communities. Selco Solar and Solar Sisters are building a future that looks similar to the 1960 back-to-the-land movement in the US, a future focused on self-sufficient, off-grid, and small-scale production as a way to achieve sustainable livelihoods. Solar Sisters has the added element of fitting this structure into a consumer-based economy of direct sales. Selco Solar and Solar Sisters have some natural limits in terms of transforming our future landscape. Unless they manage to move from the individual unit of sale to a larger systems-level change that provides consistent and reliable clean energy, unequal consumption patterns are likely to continue at the macro scale. A mere three years after the original Peer-to-Peer Energy Sales Innovation Zone was written, the solar power landscape has changed rather drastically. A possible future of peer-to-peer energy sales is coming sharply into focus. New companies focus on distribution and storage as well as the renewable energy technology itself. In order to build a peer-to-peer marketplace for any renewable energy we have to have mechanisms for easily transferring or distributing energy from producer to consumer. If everyone is simply harvesting their own energy there is no marketplace. Places that already have well built energy grids have the option of changing the policies around who is able to send power through the grid. These changes will likely face a lot of resistance from legacy institutions. As we know, it’s one thing to create technologies and possibilities, it’s another thing to change power dynamics and the social order. Old grids designed for unidirectional flow of electricity will also need to be updated. Yet, we can already see some innovative efforts underway to create peer-to-peer energy markets. Vandebron is an Airbnb-style site in Holland that links renewable energy producers directly with consumers. Instead of a farmer with a wind turbine selling their excess power to a utility which then sells it to a consumer for a profit, Vandebron is a marketplace that connects producers directly to consumers for a flat monthly rate. They truly are a peer-to-peer energy market. Vandebron is able to do this because Holland has a totally deregulated energy market. A couple of years ago utility companies were even forced to divide their production and delivery facilities, effectively splitting their companies in two. This means that a farmer with excess wind power is able to sell that energy directly to a consumer by way of the national energy grid. The peer-to-peer energy market is emerging in Holland because it has a functioning national grid and policies that allow direct peer-to-peer sales. A very rare combination! Open Utility in the UK is a commercial version of Vandebron’s peer-to-peer marketplace. Regulatory structures prevent sellers on the Open Utility platform from selling directly to residential customers. But the project has support from the UK government, receiving about US$750,000 to launch. Depending on its success, this could be the beginning of larger regulatory innovations within the UK. Both these initiatives are potentially ground-breaking. But they require a few capacities to be in place before a peer-to-peer energy market is possible. First, they need the traditional energy grids so that energy can be transferred from producer to consumer. Second, they require policies that open up access to the grid, serving as a platform for open distribution rather than a private network of wires. Does this mean that countries have to have national power grids before they can build peer-to-peer marketplaces? Is infrastructural leapfrogging possible? What if, as Nikola Tesla dreamt, we could send electricity wirelessly from producer to consumer? And, well, this isn’t exactly science fiction any longer. WiTricity is an American company that builds devices that support wireless energy—think wireless Internet router, but for electricity. Using magnetic fields, their devices allow you to forgo wires and keep your lamps, TVs, mobiles, and laptops powered and charged wirelessly. They are even working with electric vehicle companies like Tesla to build wireless charging mechanisms directly into the cars. But because magnetic fields drop off very quickly after a short distance WiTricity’s technology, as cool as it is, is only capable of short distance wireless electricity transfer. This type of wireless electricity still requires electricity to arrive in your house through a grid or household renewable energy systems. There is another, less straightforward option for longer wireless electricity. Think about this: how does the sun transmit power all the way to earth, almost 93 million miles away? The sun’s power travels to earth through its incredibly powerful light. While we know that light can transmit energy, we haven’t figured out how to safely send concentrated light long distances. Laser expert Robert Winsor might have a solution. Lasers are designed to send concentrated light long distances, and by broadening the diameter of lasers, Winsor has developed safe lasers that won’t blind or burn you if you walk into them. What’s more, he’s using infrared light to make the lasers invisible so you won’t see beams of light throughout your wireless city. His lasers do feel warm to the touch though, and don’t work through buildings or trees. Winsor has, however, already managed to wirelessly send power a quarter of a kilometer. On the receiving end of his laser is an infrared converter equivalent to a solar panel that turns the laser power into electricity. Even though the conversation rate is a mere 10 – 15%, the implications are pretty interesting, including building systems where satellites use highly efficient solar panels to beam light down to earth, right into a community’s converter. Energy storage poses big challenges for renewable energy. What happens when then sun disappears? Tesla's battery for the home is currently being released in a pilot program in California. The batteries, produced in Tesla’s new Gigafactory, are available through SolarCity, the largest provider of residential solar power in the US, is slowly replacing traditional utility companies. They install solar panels for no to next-to-no cost on customers’ roofs, selling energy to them for less than what it costs from a utility company. Excess energy is currently sold to the utilities, but SolarCity is estimating that all home units will come with a Tesla battery within five to ten years. If you have solar panels and a battery for storage you can unplug from the grid. As we become energy self-sufficient, this may signal the end of US utility companies. However, instead of mass defections from the grid, we may find that utilities become the caretakers of a distributed peer-to-peer electricity grid, managing electricity supply and demand in an efficient manner and sending clean energy when and where it is needed. This is what SolarCity director of public affairs, Will Craven, calls "infrastructure as a service." An urgent future challenge for storage is to make it environmentally friendly. At the end of the day any peer-to-peer energy market is going to collapse if it is not clean. As mentioned earlier, there are millions and millions of people just within sub-Saharan Africa waiting to access renewable energy. That’s a lot of batteries, and we don’t want to replace one unsustainable practice with another. The most common batteries, including Tesla batteries, are lithium-ion batteries. While lithium is plentiful today, it is typically found in pristine and relatively untouched swaths of land. Salar de Uyuni in Southwest Bolivia is the world’s largest salt flat at 4,085 square miles. It’s estimated to have enough lithium to power 4.8 billion electric vehicles on lithium-ion batteries. But does it make sense to destroy some of our most beautiful and wild places in the name of clean energy? The copper and aluminum that batteries require pose an even bigger problem. They have to be mined. The manufacturing process requires large energy, water, and chemical use, adding to the environmental burden of renewable energy storage. A possibly cleaner alternative to the battery is the supercapacitor. Often confused with batteries themselves, supercapacitors store and discharge energy at a much more rapid pace than batteries. This makes them excellent for electric vehicles and large machinery, but not yet for everyday things that need a more regulated energy discharge. Flexible graphene and carbon nanotube supercapacitors appear to show a lot of promise for user-friendly energy storage, though. They are currently much smaller than lithium-ion batteries and have potential to be used over and over again without much degradation. Not only do they present a possibly cleaner and greener solution to electricity storage (made primarily out of carbon), but they are flexible, giving us the potential to weave supercapacitors into clothing for wearable power systems. Not quite a battery, not quite a power plant, fuel cells offer an interesting solution for energy-impoverished areas. Fuel cells, like a cleaner, quieter, and healthier generator, take a fuel input and convert that to energy. Fuel cells have no moving parts, which make them reliable and easy to use. They tend to be efficient and can continuously convert fuel to electricity for a very long time without much degradation. The problem with fuel cells is they tend to be expensive, but that may be changing. Bloom Energy is possibly delivering on the longstanding promise of fuel cells. The Bloom Box is like a wireless power plant that is the size of a small cabbage and can sit in your backyard. Bloom Energy has figured out how to use beach sand and a cheap metal alloy to make fuel cells, dramatically cutting financial and environmental costs (no need to mine precious metals). To top it off, the needed fuel input can be something as easily available as biogas. Imagine if a secondary school that already makes their own biogas is able to buy a fuel cell. They would be able to convert their biogas to electricity, becoming totally self sufficient, and almost carbon neutral. Imagine a peer-to-peer biogas market that uses existing social infrastructures like markets and gathering places for picking up canisters of natural gas. If fuel cells become cheap enough for everyone to have in their homes, this could be a possible alternative to building an energy grid. What does this all mean for Africa and a peer-to-peer energy market? Let’s think about three scales of energy distribution and coordination: individual scale where each household or school is self sufficient in energy creation, local micro-grid scale that manages energy creation and distribution at the city or village level, and a national scale energy grid that we tend to be most familiar with. Most of the focus on alleviating energy poverty within Africa is on the household scale, like Solar Sisters. The newest and most advanced version of this model is the Paygo Solar System provided by Azuri Technologies. Consumers purchase a small solar unit that is able to charge mobiles and run two lights. They pay a small fee for the initial set up and then US$1.50 once a week to get power eight hours a day. This is, according to Azuri Technologies, an estimated weekly savings of US$1.50. After about 18 months most customers will have paid off the system itself and can choose to unlock it for unlimited free power or upgrade to a larger system. For wealthier households, there is also a proliferation of solar systems for larger electricity demands. A Ugandan company called SolarNow offers larger solar power solutions including a US$200 solar television set. Micro-grids tend to be more efficient than individual self-sufficiency. Overall, these systems tend to do more at a lower cost. So it might do us some good to think about how we can level up many of the interventions in energy poor places to focus on the community or city level as opposed to the individual. The real question we should be asking ourselves is how much infrastructure is needed for a low-cost, equally accessible, and efficient energy system? And how much is reasonable? For just under US$500,000 Kisiju Pwani, Tanzania received an aid funded solar power micro-grid. They have 32 photovoltaic solar panels and a bank of 120 batteries to provide enough electricity for 20 streetlights, 68 homes, 15 businesses, a port, the village’s government offices, and two mosques. A fuel cell-based microgrid scenario could happen if someone local purchases a large fuel-cell system and micro-grid supplies. Individuals then pay to be connected to the central power source and have the grid extended to their houses. This is exactly what happens in Kenya today, although it’s on a national grid primarily fed through hydropower. The problem with building power grids on the national scale is you have to manage federal bureaucracies, monopolies, and other inefficiencies. Additionally, places separated by mountains and forests will have difficulty connecting together. National grids do have the advantage of environmental differences, though. Places that have sun, wind, or hydropower are able to add power to one system, making clean energy more reliable. The bottom line is that with all these new and exciting technologies, clean energy is possible, and possibly so is carbon neutral(ish) development. The future of efficient and clean energy will likely comprise some level of peer-to-peer, but we have a lot of work to do before we find ourselves in the original scenario where individual producers will easily be able to sell energy to individual consumers. And it’s pretty clear that unless a central party manages this process, hopefully at the micro-grid scale, any new energy system will suffer from inefficiencies and unreliable energy flows. In the coming decades I expect we’ll see a growth of micro-grids in places that currently don’t have functioning national grids. And for places that have national grids we’ll see updates to the actual infrastructure, coupled with new policies to build an efficient and cleaner peer-to-peer network. Solar power will likely remain a mainstay to this future until the day that fuel cells, in particular hydro-fuel cells, become affordable. Research Director at Institute for the Future.